There aren’t really any gear stores near the Cal Salmon. 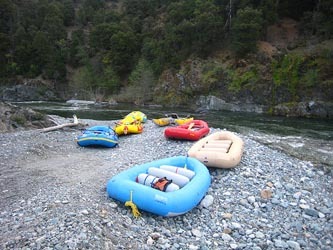 If you are coming from the California coast near Arcata, there are a few outdoor gear stores, and before you turn off I-5, you can stop in Redding to grab a few items. If you plan on doing a fair amount of cold weather boating, and you are not a seal, you might want to buy a piggy bank and start saving all your pennies to purchase a dry suit. Wetsuits are usually plenty warm, but there is nothing so great as getting out of your drysuit at the end of a long, cold, day and being, well, dry. If you do decide to splurge, get a pee zipper!